Ever wonder how HIP got its name? Well wonder no more! Allow us to take you on a journey through HIP’s history, starting from its nascence in the 1990s. Marvin Walker, long-time volunteer and recipient of the 2009 Mayor’s End Hunger Award for Community Volunteer, and Linda Berger, co-founder of HIP and 2007 recipient of the same award. 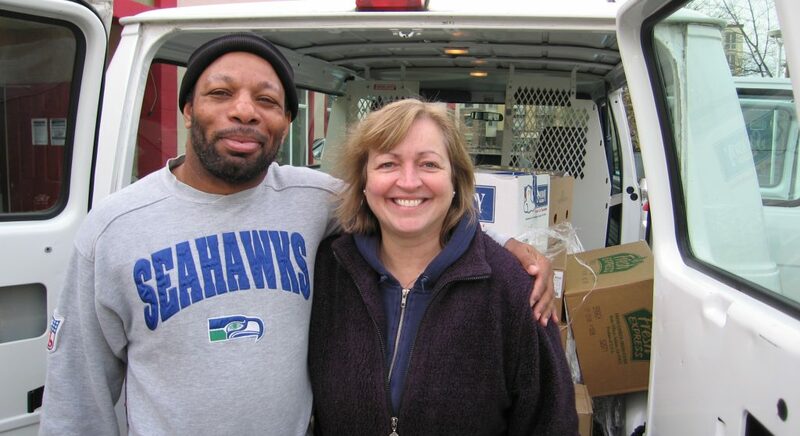 Back in the early ’90s, Linda Berger (pictured above) began working with Operation: Sack Lunch (OSL), a non-profit which still exists today feeding individuals experiencing homelessness in downtown Seattle. In 1998, OSL expanded its operations to the Lake City Presbyterian Church, where HIP was eventually created in 2005. However, it wasn’t yet “Hunger Intervention Program.” Its tentative name was “Lake City Lunches,” though that didn’t represent all of the areas in which it served. After all, it was still serving lunches at 3rd and Yesler, as well as 100 sandwiches per week to Tent City, despite a city-mandated 4-month hiatus in which all downtown outdoor feeding programs were told to stop serving until a new site could be obtained. Flying fast and loose, Lake City Lunches needed its own flag! In the search for a more all-encompassing name, long-time client and volunteer Marvin Walker (also pictured above) stepped up with the perfect suggestion. Marvin had been a staple at the downtown lunches, helping to load/unload the van, serve the food, promote the lunches, and make sure everything ran smoothly. When he heard that the new organization was nameless, he said, “You know, you guys are hip! Maybe you should name it something like that.” Thus, Hunger Intervention Program (HIP) was born. With a solidified name and clear mission, HIP began operations in north Seattle, eventually achieving 501(c)(3) status in November 2008. We are proud to be celebrating our 10th year as an official non-profit, but we also recognize that this work has been going on for over a decade, with many hearts and hands lending their efforts along the way. Hunger Intervention Program is an amalgamation of all its volunteers, staff, board members, clients, and supporters. So, what’s in a name? All of you.